The chances are that you the reader have an interest in people, their performance and their potential. Like me, it might even be your passion – I hope it is. Even so, I’m sure that you spend time considering others, supporting them, helping where you can. Maybe not as your professional vocation. Perhaps as a parent or family carer. Perhaps as a friend or “just” a fellow human. Here’s the thing though… as much as we might empathise with, understand or even try to imagine the lives of others, we’re never able to replicate life exactly as others experience it… Often our experience of life is so close so as not to matter. Sometimes there are things we just struggle to experience. I’m not sure I’d have it any other way, with one exception. Our youngest son has mild hemiplegia. We’ll never know precisely why but I remain hugely thankful to the delivery team whose quick reactions (emergency caesarean) brought him to us as safely as possible. It took some time to find out that there had been damage to part of his brain. Though an upsetting discovery for us as parents, he wears his hemiplegia “badge” proudly and without shyness. He feels strongly that it is part of him and it’s part of his way. Times have changed since I was at school but I still recognise how big a deal it’s been for him to go through his first years of school wearing these every day. The fact that he no longer needs them is down to his hard work and the expert support of his physio team. So how can I imagine what it’s like to be you my son? As part of Hemiplegia Awareness Week 2013, those clever folks at HemiHelp have come up with an ingenious idea which I’ve been trying out all day. The challenge is of course to try and mimic the greatly reduced sensation & function in your hand that often comes with hemiplegia. Hey presto, it’s Mitten Monday! It looks a bit odd but why don’t you have a go too? You’ll get an appreciation for how precious that feel & function is in our everyday lives. 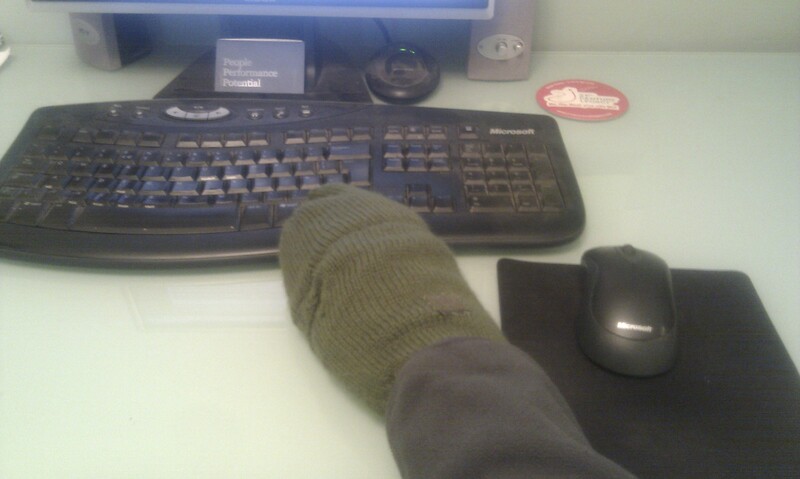 If you feel up to it then why not share your pictures on Twitter (#MittenMonday) and support @HemiHelp. Oh and if you are laughing right now at my “mitten picture” above then by all means laugh at me. Then just stop and think about that.